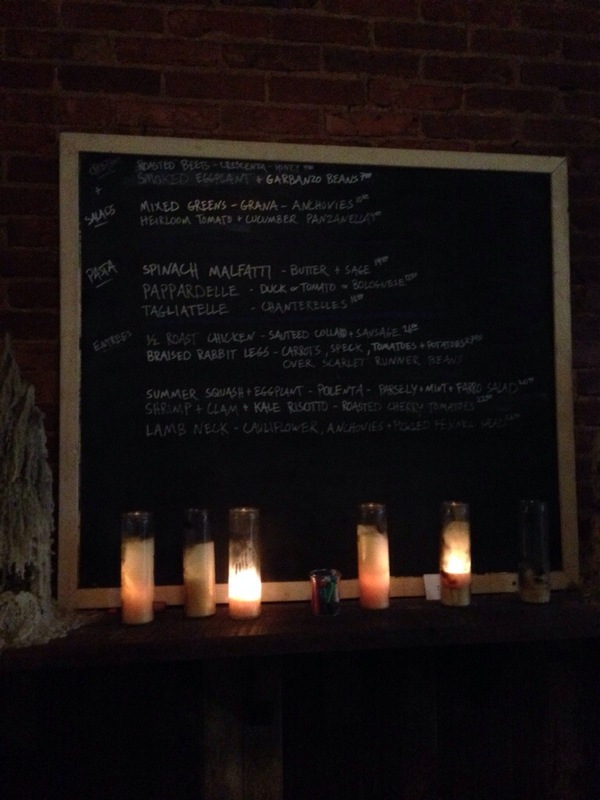 Bottega – eating my way through Charm City! Bottega is a darling, but small rustic spot on North Maryland Street in Station North. There are about 15 seats in this small row house with exposed brick. I love that they have chairs up on a rack near the ceiling to adjust table size as needed. Food wise – its is northern Italian cuisine – simple, local and fresh ingredients, which means menu is ever-changing, therefore it is written on a chalk board – usually broken into sections. If you check their Facebook page, you can see their most recent menus. I must admit – I wanted to order one of everything. Thank goodness, my friend reeled me in and we picked 4 dishes. We started with the roasted beet crostini – large slices of warm crusty, but still a little chewy bread, slathered with crescenza (a soft, mild and young cow’s milk cheese). Next the lovely folks of Bottega topped it with large slices of red beets and a drizzle of honey. What a great way to start the meal. Our next course was from the salad section. Heirloom tomatoes, cucumber, and panzanela (did you know? That’s also toasted bread – kind like a crouton?) mixed together with a garlicky olive oil vinaigrette. This was my favorite dish – so fresh and I was able to taste all the flavors individually. Why on earth did we ever move away from heirloom tomatoes?? For our main course, I ordered from the pasta section – which is slightly smaller than the actual entrée section, but let’s be real, I didn’t need more. 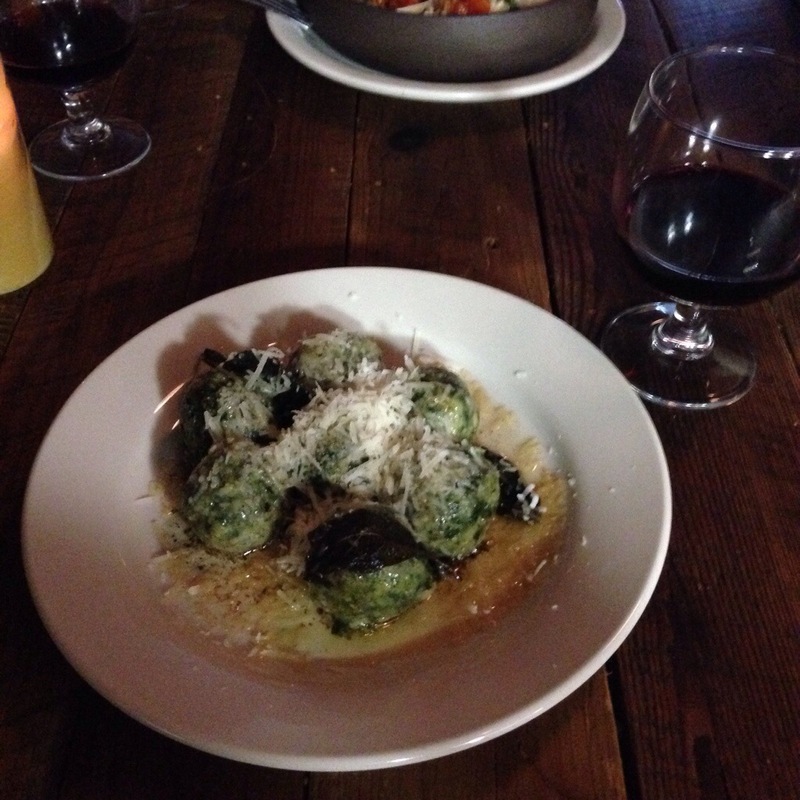 As, you can see, I went with the spinach malfatti – a light and airy gnocci-like morsels made with spinach (shocker?) and cheese and then tossed in a brown butter sage sauce. I loved it – just the perfect amount of rich fatty goodness and texture. My friend ordered the shrimp, clam and kale risotto. I really appreciate the way this place manages to blend flavors without losing texture and individual components tastes. The kale was still firm, but wilted just enough in the creamy risotto. There were at least 5 or 6 large shrimps and even more clams. My friend shared and I got two of each. Their desserts sounded fantastic, but we were full and trying to behave and opted just to finish our bottle of wine. Wait? Did I tel you the best part? They are BYOB and if you are as big of fan of wine as I am, you have plenty of bottles lying around in the house. If not, there are a few stores near by where you can pick something up. I will definitely be back for both the service and the food. These guys agree – this place is great. Have you been? This entry was posted in Charles North, Charm City, Dinner, Mount Vernon, Station North, Yay! I'm a Fan!. Bookmark the permalink. I’ve heard great reviews. Next time my parents are in town were going to head over there. Tonight I’m going to Jack’s Bistro and I’m excited. Make your rezzis as soon as you know, unless you want to eat super early or late. I can’t wait for your post on Jack’s!